6 by His Design: Giraffes...GRRRRRRRR! Halloween's approaching. I know, it's, like 6 weeks away or something. Half of you probably already have your children's costumes made/purchased and they're hanging in the closet. 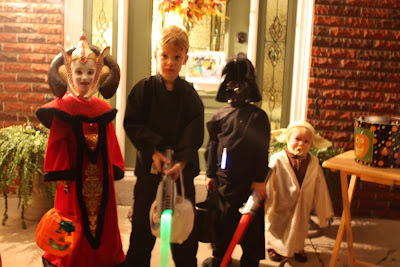 Or half of you have no idea what your kids want to be for Halloween - or you know, but you've made no moves towards it. It's 6 weeks away, after-all. Either way, I'm right. I know I'm right. So what to do this year? How can you compete with the BEST Halloween Evah?! Well, I've started prodding the youngins to start brainstorming their ideas. One: a pirate. easy peasy. Baby: Ehmo. (translated, of course means Elmo.) ebay, check. Fashionista: a giraffe. che--- wait a minute, what? You were a giraffe when you were, like, 3. Are you sure you want to be a giraffe? (I say to the person who wants to be a zoo keeper ... and moonlights as a fashion designer.) Seems easy enough. Check ebay. No. Every giraffe is no bigger than a 4T. Granted, she's tiny. But she ain't that tiny. Lookie at this li'l number. Cauuuuute! Pair that in a perfect giraffe print fabric with a pair of $10 giraffe ears and a tail, plus a nice black turtle neck and mini skirt underneath and a pair of black fashionable boots - voila! The 8 year-old's giraffe costume. Anyone know where I can get a pattern for a jacket that looks like my drawing? edited to add: I found a suitable one that comes with 27 different sizing options via a Canadian pattern company...seems like I should be able to get Little Diva her jacket out of that! Bought the boots today...we're on our way to The World's Most Stylish Giraffe!